Advisor: Dr. Felipe Bravo Oviedo and Ing. Cristobal Ordonez Alonso. Bishwajit Roy 2016. Developing a business model for the certification of small and medium forest holders at international level. Master Thesis, University of Padova. Padova, Italy. Karavani A, Cáceres M, Aragón JM, Bonet JA, de-Miguel, S. 2018. Effect of climatic and soil moisture conditions on mushroom productivity ,and related ecosystem services in Mediterranean pine stands facing climate change. Agricultural and Forest Meteorology 248 (2018) 432–440. Karavani A, Boer MM, Baudena M, Colinas C, Díaz‐Sierra R, Pemán J, de Martín L, Enríquez‐de‐Salamanca A, Resco de Dios, V. 2018. Fire‐induced deforestation in drought‐prone Mediterranean forests: drivers and unknowns from leaves to communities. Ecological Monographs, 1–29. Asaf Karavani 2016. The role of soil moisture in predicting edible wild mushroom productivity. Master Thesis, University of Lleida. Lleida, Spain. A Review of Recent Sanitary Conditions and Market Development. Resco de Dios V, Mereed TE, Ferrio JP, Tissue DT & Voltas J. 2016. Intraspecific variation in juvenile tree growth under elevated CO2 alone and with O3: a meta-analysis. Tree Physiology. 2016: 36(6):682-93. DOI: 10.1093/treephys/tpw026. Borges, J. G., L. Diaz-Balteiro, M. E. McDill and L. C. E. Rodriguez (Eds) 2014 The management of industrial forest plantations. Theoretical foundations and applications. Springer, Managing Forest Ecosystems Vol. 33, 543 p.
Luis Acevedo Muñoz 2015. A novel approach to prevent wildfires and promote nature conservation in Mediterranean Ecosystems: the case study of Reserva Natural da Serra da Malcata. Master Thesis, Instituto Superior de Agronomia, Universidade de Lisboa. Lisbon, Portugal. Noelia López García 2018. A prospective approach of ecosystem services provided by the forests in Mont Ventoux (France) under various global change scenarios. Master Thesis, University of Lleida. Lleida, Spain. Advisors: Dr. François Lefèvre and Dr. Hendrik Davi, INRA-PACA, France and Prof. Jose-Antonio Bonet, University of Lleida. Lleida, Spain. Bem Brahim Wafa 2015. Analysis and modeling of shallow landslides on the Lierza basin triggered by an extreme rainfall event on 2 August 2014: the impact of land use on shallow landsliding. Master Thesis, University of Padua. Padua, Italy. Beatriz Olmo 2014. Analysis of the performance of the 3-PG model for Scots pine in Turkey. Nforneh Paul Ambe 2015. Arsenic availability and microbial functional diversity as influenced by different plant covers in calcareous soils of central Italy. Master Thesis, University of Tusica. Viterbo, Italy. Advisors: Prof. M. C. Moscatelli, Dr Silvia Rita Stazi and Dr. Rosita Marabottini, University of Tuscia. Bawinabadi Bagaram. 2017. Assessing biodiversity related variables by unmanned aerial vehicle (UAV) remote sensing. Master Thesis, University of Tuscia. Tuscia, Italy. Diego Antonio Martinez de la Cruz 2014. Assessing public and private sector involvement in the use and conservation of agrobiodiversity: A Bolivian case study. Master Thesis, University of Padua. Padua, Italy. Advisor: Prof. Dr. Paola Gatto, University of Padua. Nouha Ghobber 2014. Assessing soil structure and porosity under different soil management strategies through micromorphology. Master Thesis, University of Lleida, Lleida, Spain. Advisors: Dr. Rosa M Poch Claret and Dr. Àngela D. Bosch Serra, University of Lleida. Amal Aloui 2016. Assessment of Local Knowledge of cactus pear and the value chain of cactus oil in the governorates of Kairouan and Kasserine, Tunisia. Master Thesis, University of Padua. Padua, Italy. Advisors: Prof. Davide Pettenella and Dr. Youssef Ammari, University of Padua. Mehzabin Rupa 2015. Association between ambrosia fungi and wood-boring beetles in Italy. Master Thesis, University of Padova. Padova, Italy. Advisors: Prof. Andrea Battisti and Prof. Davide Rassati, University of Padova. Ilaria Dalla Vecchia 2014. Attività illegali e non sostenibili nel settore forestale in Italia: i casi studio delle regioni Lombardia, Lazio e Calabria. Master Thesis, University of Padua. Padua, Italy. Advisor: Prof. Dr. Laura Secco, University of Padua. Muha Abdullah al Pavel 2017.Climate impact on early growth of Pinus pinaster Ait. University of Valladolid, Spain. Taye Zelalem Mengiste 2014. Conditional Yield Models for Edible mushrooms in Pinus pinaster stands of Soria province, Castilla and León region, Central Spain. Master Thesis, University of Lleida, Lleida, Spain. Anna Liubachyna 2014. Cross-sectoral policy effects on forests and environment: preliminary analysis. Master Thesis, University of Padua. Padua, Italy. Advisor: Prof. Dr. Laura Secco, University of Padua. Rana Adamo 2014. Detection of Fungal DNA in Forest Soils: Optimization of Molecular Techniques for High-throughput Sequencing. Master Thesis, University of Lleida, Lleida, Spain. Advisors: Prof. José-Antonio Bonet and Dr. Christine Fischer, University of Lleida. Advisor: Prof. Dr. Felipe Bravo, University of Valladolid. Motaz A. Abdelaziz 2018. Discovering the environmental factors affecting the distribution of Terfezia claveryi Chatin in the Northwest of the Region of Murcia. Master Thesis, University of Lleida. Lleida, Spain. Advisors: Prof. Dr. Asuncion Morte and Dr. Alfonso Navarro, the University of Murcia, Prof. Jose-Antonio Bonet, University of Lleida. Lleida, Spain. Araceli. Ruiz Guillamón 2014. Drought response assessment of 3 cork oak provenances. Master Thesis, University of Lisbon. Lisbon, Portugal. Effects of Collembolan (Springtails) on Soil Aggregate formation and Stabilization: A trait-based Approach. Md Ekramul Haque 2018. Effects of Collembolan (Springtails) on Soil Aggregate formation and Stabilization: A trait-based Approach. Muhammad Muddasir 2015. Efficacy of Biochar in Reducing Cu and Zn Toxicity in Manure Sludge Using Biological Indicators. Master Thesis, University of Tuscia. Viterbo, Italy. Wenhao Wang. 2017. Estimating Sustainable forest management (SFM) indicators at operational scale in central Italy. Master Thesis, University of Tuscia. Tuscia, Italy. Zoi-Antigoni Sideri-Manoka 2017. Master Thesis, University of Tuscia. Tuscia, Italy. Koffi Dodji Noumonvi 2018. Estimation of carbon fluxes from eddy covariance data and satellite-derived vegetation indices in a karst grassland (Podgorski Kras, Slovenia). Master Thesis, University of Lisbon. Lisbon, Portugal. Mohib Abdullah 2014. Ex situ conservation strategies of walnut and poplar genotypes by means of in vitro slow growth and cryopreservation methods. Master Thesis, Tuscia University. Viterbo, Italy. Advisors: Dr. Elena Kuzminsky and Dr. Emilia Caboni, University of Tuscia. Sidra Khan . 2017. Exploring the spatiotemporal dynamics of golcuk planning unit over 43 years and its implication to ecosystem management planning and the international conventions Master Thesis, University of Tuscia. Tuscia, Italy. Daniel Hagos Berhe 2018. Feasibility of NIR Spectroscopy in Classifying Pine Nut Species Beech. Master Thesis, University of Tuscia. Tuscia, Italy. Advisors: Dr. Mariagrazia Agrimi, Prof. Dr. Riccardo Massantini, Dr. Roberto Moscetti, University of Tuscia. Juan Mena Costa 2016. Forest Dynamics in Mediterranean Forest using Landsat imagery and Lidar. Master Thesis, Karadeniz Technical University. Karadeniz, Turkey. Houda Ben Salah 2015. Forest stands characteristics of the Salamandra atra aurorae Trevisan habitat: a study at the Bosco del Dosso (Asiago, Italy). Master Thesis, University of Padua. Padua, Italy. Advisors: Dr. Tommaso Sitizia and Dr. Thomas Campagnaro, University of Padua. Amal Mokhtar 2014. Implementation of the Strategic Framework of Mediterranean Forests in the National Forest Programs of the Maghreb countries: a regional comparative analysis. Master Thesis, University of Padua. Padua, Italy. Abdullah-Al Mamun 2018. Intra-specific differentiation in the investment on carbon resources on Pinus nigra. Master Thesis, University of Lleida. Lleida, Spain. Advisors: Prof. Dr. Luis Serrano and Prof. Dr. Monica Aguilera, U of Lleida. Samson Osadolor 2018. Isolation and characterization of monoterpene synthase genes from Pinus nigra subsp laricio in Calabria. Master Thesis, University of Tuscia. Tuscia, Italy. Advisors: Prof. Ciaffi, University of Tuscia. Tuscia, Italy. Siba Ghadban 2018. Key local landscape and stand structure variables explain biodiversity of Mediterranean forests in Catalonia, Spain. University of Lleida. Lleida, Spain. Advisors: Prof. Cristina Vega-Garcia, University of Lleida. Iva Kacarska 2014. Labeling and certification of forest products in Mediterranean mountain areas: case-studies in Italy and Montenegro. Master Thesis, University of Padua. Padua, Italy. Andrii Khomiuk 2018. Large-scale assessment of storm damage to forests using Sentinel-2 imagery and LiDAR data. Master Thesis, University of Lleida. Lleida, Spain. Leaf Morphology characteristics of tree species for particulate matter deposition in an industrial city of central Italy. Susana Dreveck 2018. Leaf Morphology characteristics of tree species for particulate matter deposition in an industrial city of central Italy. Berta Briñas García 2014. Mapping and identification of hotspot areas for biodiversity and Ecosystem Services in cork oak woodlands of southern Portugal. Master Thesis, University of Lisbon. Lisbon, Portugal. Advisors: Dr. Miguel N. do S. M. Bugalho and Ms. Filipe E. Parreiras Silva Dias, University of Lisbon. Dongmei Chen 2015. Mapping Fire Regimes in China Using MODIS Data. Master Thesis, University of Padua. Padua, Italy. Advisors: Dr. Francesco Pirotti, University of Padua and Prof. José M.C. 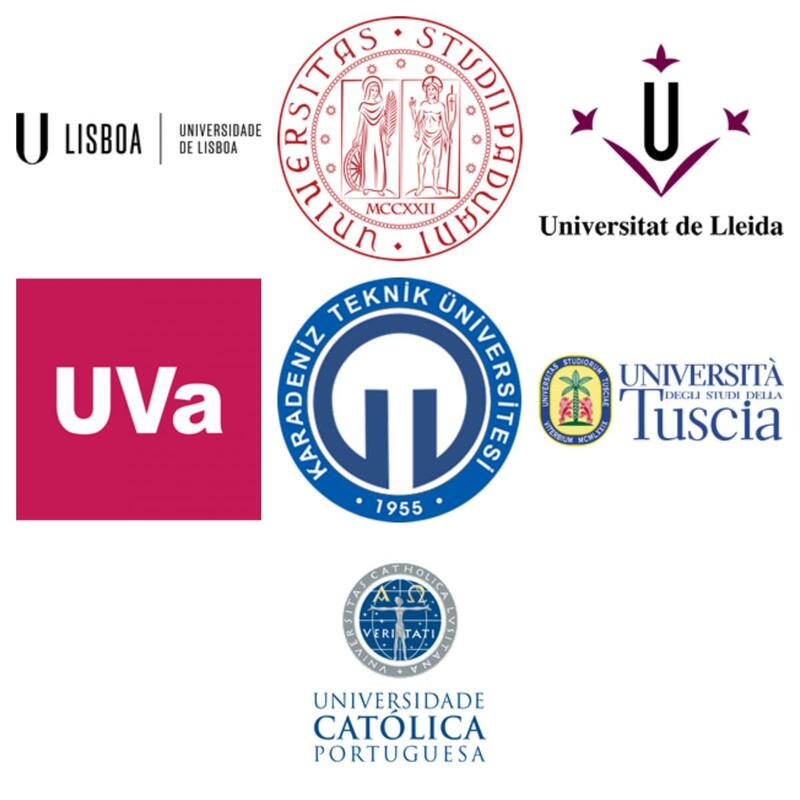 Pereira, University of Lisbon. Market Development of Pine Products in European Union: Decline or Diversification? Umair Masood Awan Hafiz 2014. Market Development of Pine Products in European Union: Decline or Diversification? Master Thesis, University of Padua. Padua, Italy. Advisor: Prof. Dr. Davide Matteo Pettenella, University of Padua. Sacha Khoury 2014. Measuring Telomere Length in Plant and Tree Species. Master Thesis, University of Tuscia. Viterbo, Italy. Advisors: Dr. Antoine Harfouche and Dr. Paolo Latini, University of Tuscia. Hala Shahin. 2014. Monitoring two REINFFORCE network arboreta adaptation to climate change and abiotic factors. Master Thesis, University of Lisbon. Lisbon, Portugal. Serajis Salekin. 2014. Natural diversification of black pine forests in the pre-Pyrenean mountains (NE Spain): the role of stand structure and canopy attributes. Master Thesis, University of Lleida, Lleida, Spain. Advisors: Dr. Lluis Coll and Dr. Santiago Martín, University of Lleida. Advisors: Prof. Elena Kuzminsky and Dr. Roberta Meschini, University of Tuscia. Danilo Reis Gonçalves 2018. qPCR as a technique to detect Fusarium circinatum in different samples. Master Thesis, University of Valladolid. Palencia, Spain. Advisors: Dr. Julio Javier Diez Casero and Prof. Dr. Pablo Martínez Álvarez, University of Valladolid, Spain. Regulation and ecological importance of extended diapause in forest insects, with specific reference to the Pine Processionary Moth Thaumetopoea pityocampa. Rahman Salman Md Habibur 2014. Regulation and ecological importance of extended diapause in forest insects, with specific reference to the Pine Processionary Moth Thaumetopoea pityocampa. Master Thesis, University of Padua. Padua, Italy. Advisor: Prof. Dr. Andrea Battisti, University of Padua. Sudip Pandey 2014. Relationship between climate and wood-anatomy parameters on Pinus sylvestris L. from Northern Finland. Master Thesis, University of Padua. Padua, Italy. Advisor: Prof. Dr. Marco Carrer, University of Padua. Babla Mohajan 2018. Relationship between leaf phenology and anatomical traits of xylem in Beech. Master Thesis, University of Padua. Padua, Italy. Advisors: Prof. Dr. Marco Carrer, U of Padua. Abdelaziz Ben Abdallah 2015. Resilience of forest public authorities to forest policy reforms in Tunisia. Master Thesis, University of Padua. Padua, Italy. Advisors: Prof. Dr. Laura Secco, University of Padua and Dr. Irina Kouplevatskaya Butoud, FAO- Roma. Ghenima Ghemouri 2015. Socio Economic valuation of NTFP in Algeria: A case study on medicinal plants in the National Park of Djordjuna. Master Thesis, University of Padua. Padua, Italy. Advisors: Prof. Dr. Davide Pettenella, Dr. Rachid Meddour and Dr. Sabrina Tomasini, University of Padua. Susana Patricia da Silva 2014. State of the Mediterranean Forest genetic resources in a climate change context. Master Thesis, University of Lleida, Lleida, Spain. Advisors: Dr. Bruno Fady and Dr. Luis Serrano, University of Lleida. Ishida Yu 2015. Sustainable Use of Wood for Energy Comparison of Energy Support Schemes for Domestic Use of Wood between Germany, Italy, Japan, and UK. Master Thesis, University of Padua. Padua, Italy. Advisors: Prof. Dr. Davide Mateo Pettenella and Prof. Dr. Mauro Masiero, University of Padua. Mohammad Maruf Billah. 2017. The relationship between climate and tree growth rate on various tree species across Canada and USA with focus on divergence decadal climate oscillations. Master Thesis, University of Tuscia. Tuscia, Italy. Bikash Kharel 2018. The use of barcoding sequences for the construction of phylogenetic relationships in the Euphorbiaceae. Master Thesis, University of Padua. Padua, Italy. Advisors: Prof. Dr. Alsessandro Vannozzi from u of Padua and Prof. Dr. Oliver Gailing, from University of Gottingen, Germany. Travel Cost and Contingent Methods for Economic Valuation of Urban Forests: Parque da Cidade do Porto Case Study. Jiezhi Xu 2015. Travel Cost and Contingent Methods for Economic Valuation of Urban Forests: Parque da Cidade do Porto Case Study. Catholic University of Porto. Porto, Portugal. Advisor: Dr. Miguel Sottomayor, Catholic University of Porto. Ana Martín Ariza 2015. Trends in wildfire risk at time-scale: optimizing fuel treatments configurations in eucalyptus plantation in Portugal. Master Thesis, University of Padua. Padua, Italy. Advisors: Dr. Francesco Pirotti, University of Padua, Eng. Tiago Martins de Oliveira and Dr. Brigite Botequim, University of Lisbon. Alex Pra 2015. Woody biomass for energy market: towards a new estimation of the consumption and production levels in Italy and a comparative analysis between Italy and Spain. Master Thesis, Padua University. Padua, Italy.